Optik is a company that works largely in international collaboration producing site-based installation and performance work. As part of a project happening in Brazil in October 2000 an experiment took place in tele-presence linking up in real time two performance sites, one in Sao Paulo and one in London. The first stage of the experiment took place at Brunel University on Saturday October 14 2000, two weeks before the planned link up with Sao Paulo. Two studios were used. 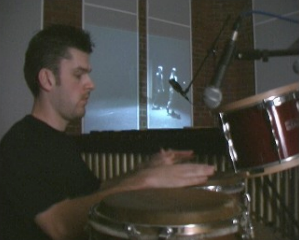 In one studio the percussionist Simon Edgoose installed a drum and percussion kit. In another studio (in fact only across the corridor of the Arts and Social Sciences Faculty building) were the three performers, Clare Allsop, Simon Humm and Hannah Seaton. Both studios were set up with projectors, sound and video. The experiment was open to the public, and started at 7pm. Spectators were free to go from studio to studio, stay and listen to the music, watch the performers’ actions, or watch the images that were projected in each of the studios. The experiment lasted approximately fifty minutes. On October 26 2001 Optik gave a performance in the Karman Theatre in Sao Paulo Brazil. Open to the public it was scheduled to start at 9pm. At the same time Simon Edgoose was in the music studio (the same studio used for the preparatory experiment) with his percussion and an audience of around 35 people. Local time in London was 11pm (3 hours ahead of Sao Paulo). It had taken two days to set up the equipment in the Karman Theatre to run the tele-presence link up. The PC was in place, but essential bits were missing and had to be bought in the city. Communication was difficult because the phone line to the theatre had to be brought down to the performance space from the office upstairs, and when the computer was on line we had to use a mobile phone to make contact with the technical team in London. In dramatic fashion we finally had an image from London of the spectators sitting in the studio, and this received a round of applause. We had our camera focussed on a small group of Brazilian audience waiting for us to start, and this was received in London. Speed of transmission was a major factor. We were getting approximately one image every two minutes – extremely slow indeed, thus removing all of the movement quality found in the London studios experiment of two weeks previously. Sound, however, was not a problem, and Simon’s drumming was heard clearly and without delay through the speakers in the Sao Paulo theatre. Brazilian audiences do not expect to start on time, but at 9.30 pm (11.30 pm London time) we began performing, and asked Simon to start playing. The technical team in the Sao Paulo theatre removed the visual signal coming from London in an attempt to send a faster signal rate to London. This was moderately successful, with London receiving about one frame every 30 secs. Once the performance was underway it was not possible to know if Simon had stopped playing, or if the signal was down. For about fifteen minutes there was no sound from London, but in fact Simon was playing a cymbal quietly and this was not being picked up and everyone in Sao Paulo thought the signal had gone. The web camera, which was in a fixed location (due to cable length) failed to pick up the audience and performers who had moved to a far end of the space, and so people in London thought that either the event was over, or that the signal had gone. This apparent feeling of two separate events with no link was shattered by the voice of the technicians talking to each other (also relayed over the speakers) saying ‘keep going, it’s working’ followed by Simon drumming furiously and very loudly. It was a dramatic moment. Simon kept playing in London until gone 1am. The performance event in Sau Paulo concluded at about 10.30. There was no linked up sense of resolution or ending, which led to a strange separation at the final moment – the link was turned off. It had an emotional impact, especially on the performers. PCI codec, one of which was also used for the Sao Paulo link up. mixer. This offered a view of the audience in addition to the performer. in GB012 where the drummer was to provide audio feedback both from Brazil and the sound technician and technical director. From the control room the sound technician was able to monitor all the drum channels, the sound from Brazil and the talkback mic. Each performer is able to engage an action from a mutually exclusive set of action options (ie actions that cannot be undertaken at the same time). These are: stand, walk, run, lie on the floor, roll. There is no pre-planned order in which these actions can be undertaken, and no pre-planned strategy for relating or responding to other performer’s actions. Each performer is in a constant mode of deciding on which action to engage and for how long (there is no pre-planned resolution to any sequence of action or singular action). It has been found that this allows the performer (and the spectator) to explore deeper emotional resonances linked to the body in space and time, such things as rhythmic patterning, closeness, parting, coming together, simultaneity. There is an interesting link between the binary nature of much of the action based decision making (do this or do that), and the digital transmission of the action in the projected image. This was particularly noticeable in the twin studio October 14 experiment where the movement images were being transmitted in stops and starts. So when a performer, for example, is walking in the real space in real time, they can stop or continue at any time. At the same time the projected digital image of this walking, processed via the computer, can also stop or continue at any time. When this happens a frame of the performer is ‘frozen’ (she stops) but when the frames resume at a faster rate there is a moment when the ‘frozen’ performer remains on screen and ‘meets’ the walking performer who is now moving. At this point there are three performers, the live one, the moving digital one, and the ‘frozen’ one. But it is a fleeting moment, and all the more resonant for that. The main collaborators in the experiment: Barry Edwards, creative director, Optik; Ricardo Cohen, Instituto de Artes / Departamento e Artes Cenicas UNICAMP; Keith Buckman, tele-presence project technical director; Ben Jarlett; curator administrator Tracey Warr. Video archivist Terence Tiernan. Artist collaborators Clare Allsop, Simon Edgoose (percussion), Simon Humm, Hannah Seaton. Other collaborators: Ricardo Karman and Kompanhia Teatro Multimedia;; Faculdade de Comunicado e Filosofia da PUC/SP; Departments of Performing Arts, Information and Computer Services Brunel University. Funded by Karman Theater, Assessoria de Relacoes Institucionais e Internacionais da PUC/SP.